Mohammad Rubel Hossain was born 1 January 1990 in Bagerhat. He is a Bangladeshi cricketer. He made his ODI debut on 14 January 2009 in Bangladesh's victory over Sri Lanka, where he took 4/33 in 5.3 overs in a shortened ODI game. He made his Test debut on 9 July 2009 against the West Indies, and took 3 wickets. He has also featured in two Twenty20 matches, both coming in the 2009 ICC World Twenty20. A right-arm fast bowler with a sling action, Rubel Hossain made an immediate impact in his ODI debut, troubling the batsmen with his bouncers and ending with match-winning figures of 4 for 33 against Sri Lanka. He began by playing taped tennis ball cricket in his hometown Bagerhat, but his talents were discovered during a pacer hunt program where he topped the speed gun. He made his cricketing debut in 2007, against Khulna Division, for whom his hero Mashrafe Mortaza plays. Find Rubel Hossain profile and stats of batting, bowling and fielding including latest updated news of Rubel Hossain, videos and images at Hamariweb.com. 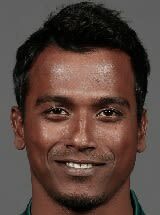 Also find detail Player profile and career statistics of Rubel Hossain of Bangladesh. Rubel Hossain - Find Rubel Hossain of Bangladesh Cricket Team complete player profile, number of matches, runs score, wickets & catches, Statistics, Records, Rubel Hossain Latest News, Rubel Hossain Videos, Rubel Hossain Photos, and other Rubel Hossain Cricket Team players.